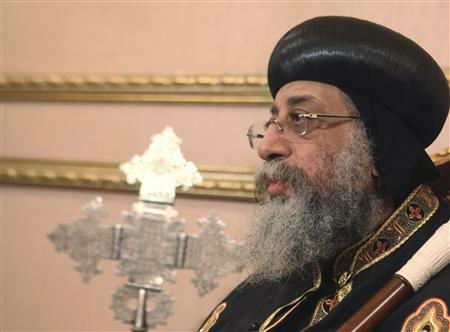 The head of Egypt's Coptic Orthodox Church, Pope Tawadros II, paid a visit on Friday to major Catholic churches in Cairo to extend his best wishes for Christmas. The pope expressed his joy that members of all of Egypt’s religious denominations and faiths were participating in this year’s Christmas celebrations. “Let the birthday of Jesus Christ be a celebration of love in our lives and all our nations,” he said. The pope’s tour, which had other senior clerics, included the Catholic Patriarchate headquarters in Cairo’s north-eastern Kobry Al-Qobba district as well as the Patriarchate of the Roman Catholic in central Cairo. Egypt’s Catholics, a minority of the country’s Christian Copts, celebrate Christmas on 25 December. Unlike other Western denominations, Egypt’s Coptic Orthodox Christians celebrate Christmas on 7 January in accordance with the Julian calendar. The Pope also visited the Greek Orthodox Patriarchate which is also celebrating the annual festival on Friday. Egypt’s Christians make up about 10 percent of the country’s 90 million people, with Catholics estimated at around 500,000.